England manager Roy Hodgson says the country's top young talent is struggling to break through. So far this season just 35.2% of the 349 players used in the Premier League have been English. "The Premier League is fantastic. But it embraces all the top European players," said Hodgson. "Top talent, at a young age, finds it difficult to break into the team because of the established European talent in front of them." After seeing two players struck down by illness, the former West Brom boss was forced to call-up three relatively inexperienced players. The fact the Under-21s were in action on Monday in their final European Championship qualifying match had some bearing on his decision, as he chose new names rather than promote from Stuart Pearce's side. Jake Livermore, who made his England debut against Italy last month, uncapped Adam Lallana of Southampton and Liverpool youngster Raheem Sterling all joined the squad ahead of Tuesday's World Cup qualifier with Ukraine on Tuesday. 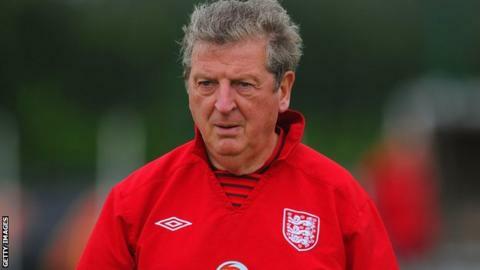 "Every club manager has only one duty - to his club," added Hodgson. "We, as England, can't start asking clubs to consider us when they're making decisions about their players. "We just have to hope that the English talent that's being produced - and it will be because we have good academy systems - are still to be considered by their club managers and are good enough." In the inaugural Premier League season of 1992-93, 391 of the 544 players used - or 71.9% - were English. The following season that figure had dropped only slightly to 70% but by 2007 the figure hit an all-time low of just 33.6% with just 179 of the 532 players used during the season qualifying to play for the Three Lions.